A couple of days back, I went to lunch with a friend from work. Typically, we pick up food at a fast food joint and hang out, but this time around, we decided to stop by Solo Point in Steilacoom. It's a little beach and boat launch point that's close enough to my work to enjoy on my lunch break, and there's usually no one out there, so it's quiet and relaxing. It wasn't quiet this time. Instead, we saw the entire place packed with cars, so I assumed that there may have been some boat races -- it's that time of year, after all. I asked a passing woman what the event was, and I was told that it was an annual tribal canoe ceremony, where representatives from several tribes across the coast row their canoes on a 14 day trip from Squaxin all the way to Cowichan, Canada. At various places along the way, they are involved in an ancient welcoming ceremony, where people on the shore grant them permission to step onto the dry land where they can stock up on food and supplies, as well as participate in local tribal celebrations. We stayed and watched as the canoes approached the land, rounded themselves into a circle, and came ashore, each with a representative of their tribe announcing who they were, and requesting assistance from the people on the shore. It was mesmerizing, really. Culture is fascinating to me. The idea of being a part of an ancient tradition that's passed down through generations is strange and wonderful; the amount of meaning and shared identity... it's mind blowing. I've never experienced anything quite like it. I tend to shy away from the notion of national identity on account of my disdain for nationalism at any level. However, at times I wonder if it's possible to enjoy the feeling of belonging to something larger than yourself without at the same time feeling as though your group or cultural identity isn't somehow superior. Can one straddle that line, as it relates to culture? I don't know. It is very interesting to me, though. Thank you for your beautiful pix and story about the canoes. I am so glad that you decided to go to lunch at Solo Point and got to witness the canoe landing which is part of the larger Paddle to Cowichan - Tribal Journey 2008. I agree about the importance of an ancient tradition to follow. I'm sure you realize that the point of the Native Canoe Journeys is Not to say any culture is "superior" to another, just as Cinco de Mayo, Oktoberfest, Chinese New Year and other cultural celebrations are not making such a statement. Recognizing one's cultural heritage and having traditions to follow (whether practiced often or not) is a stabilizing factor - At least we have found it so. We have seen the youth of our tribal communities who participate in the annual Native Canoe Journeys and related events and gatherings throughout the year become more grounded at home, school and the greater community. As it says the TribalJourneys.com site, on the page "1st Journey Tips", it's not a vacation in any sense, but a lot of hard work and it gives much opportunity for personal growth. 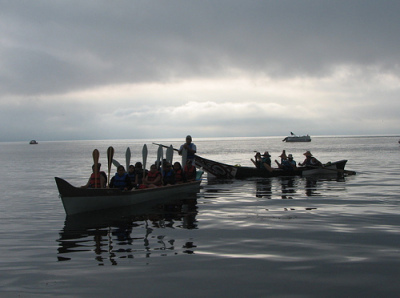 We have been involved in the Native Canoe Journeys since 1993 - the Paddle to Bella Bella, B.C.. Thanks again for the good review of the canoes. Please feel welcome on the Journey events any time. Sue Charles - yes, I agree that what I saw with the canoe landings and the shared tradition isn't a matter of claiming superiority. But for some one in my situation, where I've grown up with pieces of traditions from my diverse background (I'm fully half Korean, and almost half euro-blend, with a touch of Cherokee and Apache), for me to cling to any one tradition feels strange to me. And yet the idea of "creating my own traditions" really means "sorry -- you're on your own, here." The idea of shared culture feels so foreign and distant to me.